October’s theme for the preschool prep program is Fall Family Fun and Pumpkins! 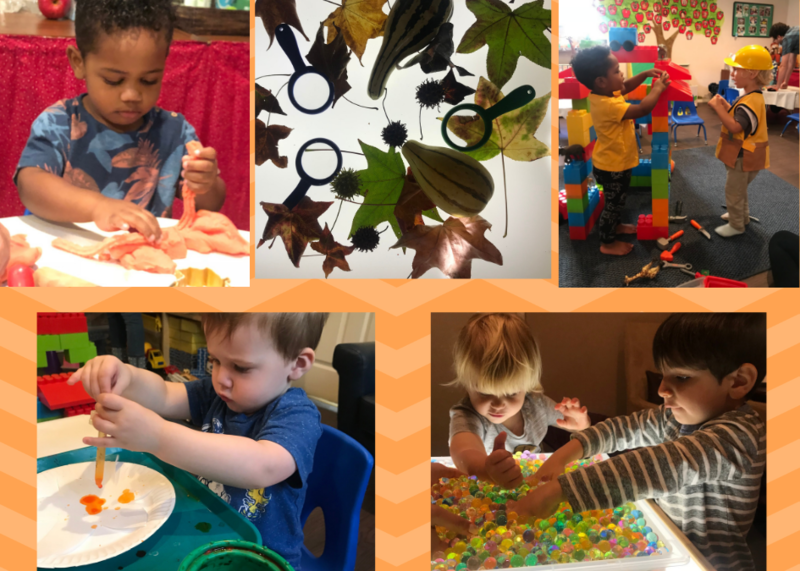 Marilee brought in leaves and seed pods from her yard this week – the leaves are turning various, beautiful fall colors, and the children enjoyed exploring them in our sensory table, along with the pinecones we added last week. We brought in gourds and children learned the words “smooth” and “bumpy” to describe the surface of the gourds. Preschool preppers used wax paper with orange, red, and green colored tissue paper to create “Stained glass” leaves that we have on display on our windows. We also made colorful fall leaves using drop paint. The children honed their fine motor skills using droppers to squeeze orange, red, and green watercolor paint onto white filler paper leaves that we laminated and hung from branches on our ceiling. Children learned a new word: “absorption.” We continued to have fun with orange play doh; our cookie cutters and rollers are fun Fall and Halloween shapes this month! We added to our sensory play with sensory water beads. Some children enjoyed putting their hands in the water beads and feeling the effects on their hands, while others were not so fond of it! The children also enjoyed building and creating together using our new giant lego set! For snack time, we experimented with a few new fall-themed snacks, including pumpkin muffins with pumpkin butter, and zucchini muffins that were brought in by one of our students as a special treat. We used our new apple peeler and the children experienced peeling apples with this exciting tool. After watching how the peeler works, they were each able to take small slices of apple for their snack!